Do you want massive hamstrings and a strong lower back? 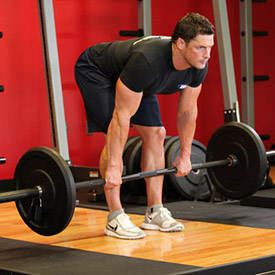 Then the stiff-legged deadlift is perfect. Use this exercise with any of the following methods and watch them grow. Bodybuilding is a sport that is judged very intently. It is not as much about what you are strong on as much as it is what you are missing or lacking on. Hamstrings are a muscle group that has decided more than one contest in competitive bodybuilding both on the amateur level and as high as the Mr. Olympia itself. If you have great hamstrings, your chances of victory increase by a lot. If not, consider the top 10 a good day. How Do You Build Hamstrings? Good question. There are a few movements that can help you develop the back of the thigh but one stands head and shoulders above the rest. Of course I am talking about the Stiff-Legged Deadlift. This movement is not an easy one to master but you will want to so you can reach your full bodybuilding potential. Grasp a bar using an overhand grip (palms facing down). You may need some wrist wraps if using a significant amount of weight. Stand with your torso straight and your legs spaced using a shoulder width or narrower stance. The knees should be slightly bent. This is your starting position. Keeping the knees stationary, lower the barbell to over the top of your feet by bending at the hips while keeping your back straight. Keep moving forward as if you were going to pick something from the floor until you feel a stretch on the hamstrings. Inhale as you perform this movement. Begin bringing your torso up straight again by extending your hips until you are back at the starting position. Exhale as you perform this movement. Repeat for the recommended amount of repetitions. You can use dumbbells or the Smith Machine for this movement as well. 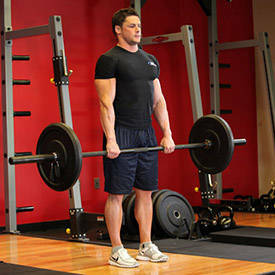 For more information on all the ways to do the stiff-legged deadlift and video instruction on each check out Bodybuilding.com's Exercise Database. You can see all of this for yourself and even rate how helpful each of the tips are to you. Besides the wrist wraps, a belt would be another good accessory to have when training so you can train your hamstrings without injuring your back. Also make sure you stretch thoroughly to decrease the potential of injury. Are you ready for the gym? I thought so. These workouts are a little different than what you may be accustomed to doing but they will ensure that you have done all you can do to build the back of the leg to the best of your ability. Designed by the author of "Body by Design" and the Editor-in-Chief of the Bodybuilding.com Supersite Kris Gethin, DTP consists of 12 sets ranging from 50 to 5 and back to 50 again. You rest for 45 seconds between sets. This program serves many purposes including less time in the gym, the first set counting as a warm up, cardio benefit with the short rest breaks, and more. Fascia Stretch Training 7 is the system that was made famous by The Pro Creator and founder of Evogen Nutrition Hany Rambod. You do base exercises like you would in a normal high volume training program and finish with seven sets of 8-12 reps with 30-45 seconds rest in between. FST-7 has been used by many greats including Phil Heath and 4 Time Mr. Olympia Jay Cutler. If it is good enough for them, you should consider it. Same as the original routine....only backwards. You start with the sevens and then go on to your base movements. This really shocks the hamstrings and will lead to even more shocking results. Dorian Yates is the master of HIT and using squats just feels right. You do a warm up set with light to moderate weight. Rest for 1 minute and do a second set with more weight that should only be slightly difficult. Finally you go for 1 all out set for 6-8 reps. This might not seem like it is difficult but go check out the Blood and Guts video series here on Bodybuilding.com and you will have a new appreciation for the intensity and effort involved. You will want to do this for stiff-legged deadlift and then a second movement to blast the hamstrings. In case you are short on time this is a great routine to get you in and out of the gym. This is unique and if you never tried this before you will be in for a shock. You choose a weight that is moderate in effort for you to use. Go for as many reps as you can until you reach failure. You go for as many reps as you can and once you hit failure you rest for the number of seconds it takes to get to a total of 100. Let's say you got 35 reps on your first set as an example. You rest for 65 seconds before continuing (35 + 65 = 100). Once you finish resting you do another set until you reach failure again. Say you get 25 more this time. You take that 25 and add the previous 35 for 60 total reps. You now rest for 40 seconds (60 + 40 = 100). Now you do a third set and get 20 so now you are up to 80 total reps. That means you rest for only 20 seconds. This process continues until you get to 100 total reps. This appears complicated but once you do it you will understand it and may even enjoy the challenge in getting to 100 total reps with less rest than the previous workout. Understanding how important it is to train every bodypart is a big step toward success not just in competitive bodybuilding but also with your health in general. Nothing should be considered secondary when it comes to training. Taking the hamstrings as serious as every other bodypart will lead to better hamstrings and a better body overall.